Aug 1, 2017, New Delhi, India: ‘Is this product made in China?’ is the question many Indian consumers unfailingly ask the seller while buying most of the products nowadays. Chinese products have made a way in almost every household nowadays. They might not be of the best quality but are cheaper than their Indian counterparts and provide value for money. 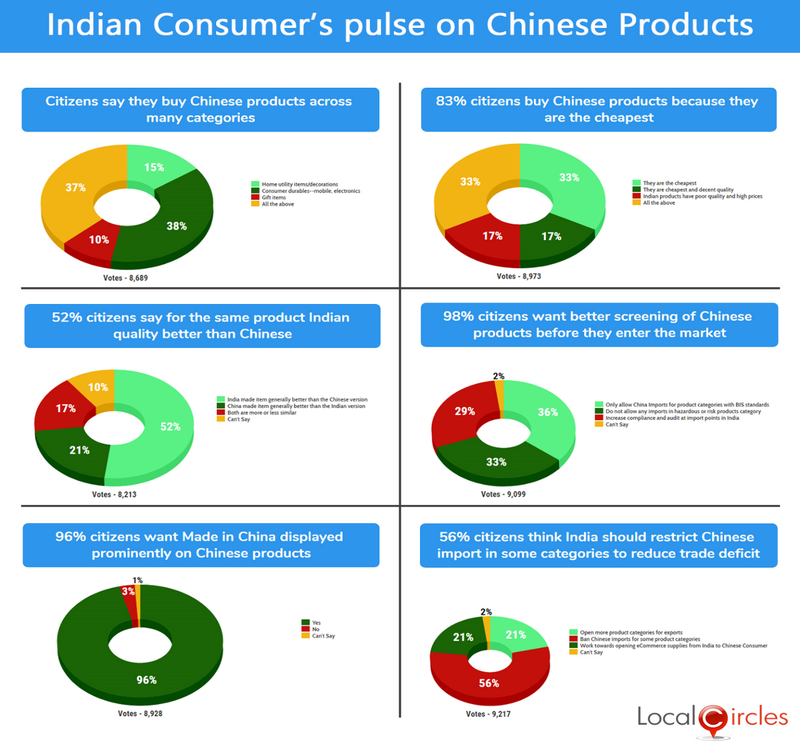 LocalCircles decided to conduct a detailed survey to understand consumer’s perception about Chinese imports in India. Why Indian consumer’s buy Chinese products? Quality issues and cost advantages? What should be done to improve quality? How to reduce risk from these imports and impact on the overall trade deficit that India has with China? When asked about what category of Chinese products do citizens buy most, 38% of the 8,689 people who voted replied saying they buy consumer durables like mobiles and other electronic items. 15% said they buy home utility and decoration items while 10% bought gift items. 37% said they buy Chinese products across all these categories. The highest number is of consumer durables as these products are easily identified as Chinese. A number of other products do not have any marking to classify them as Chinese. 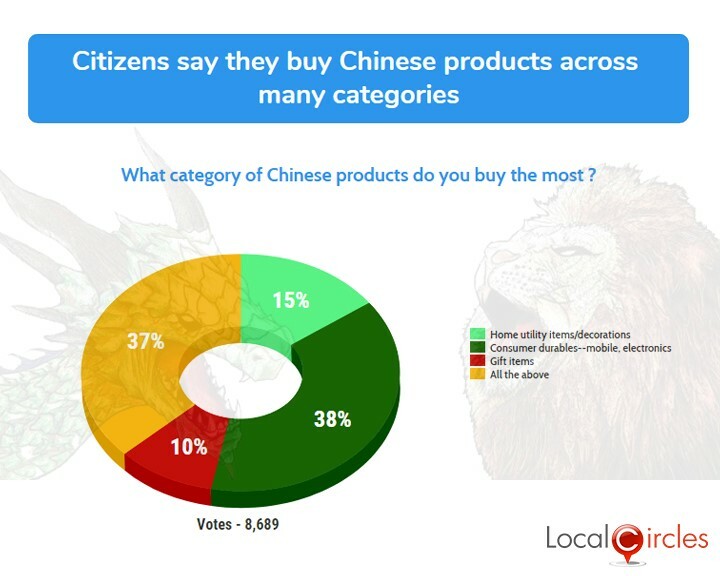 The second poll asked people why they bought Chinese product? 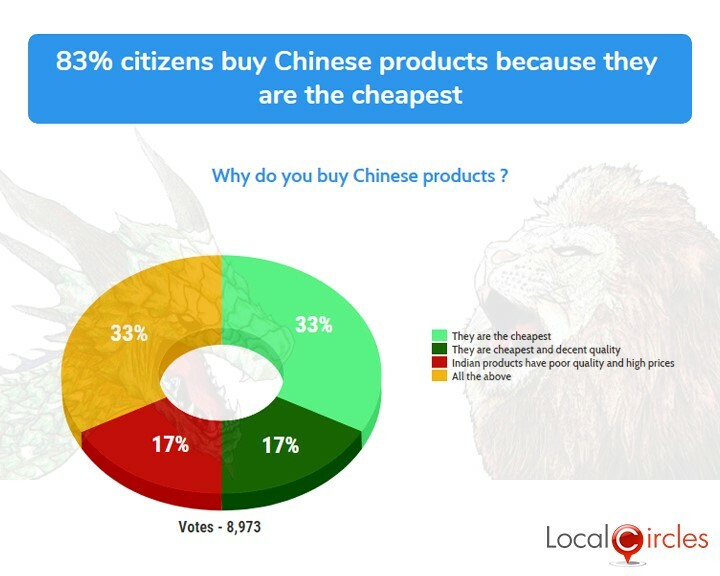 Around 33% said they buy Chinese products because they are the cheapest, 17% said they are cheapest and decent quality, 17% said Indian products have poor quality and higher prices whereas 33% said they buy Chinese products due to all the above-mentioned qualities. 8,973 votes were polled on this question. 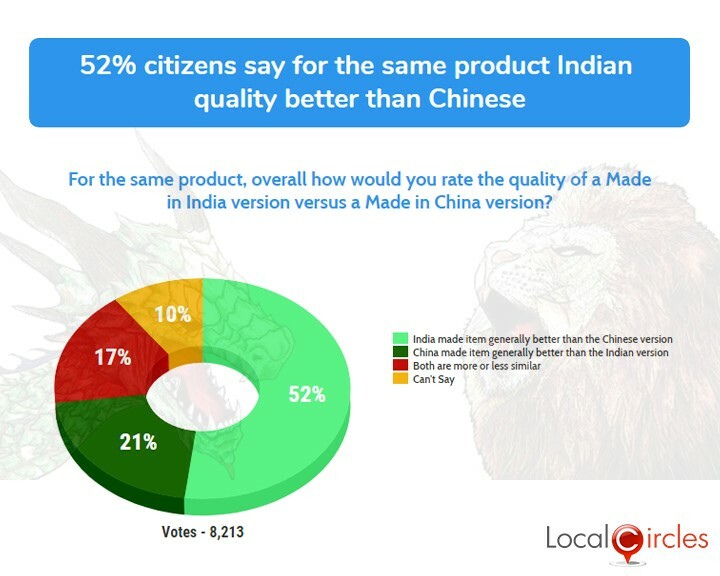 In the third poll, 52% citizens said that for the same product, Indian made items were generally better in quality than the Chinese version. 21% said Chinese made items were better in quality than the Indian made and 17% said both are more or less similar in quality. 10% were unsure about their choice. 8,213 people voted on this poll. Although the quality of the India manufactured products are far more superior than its Chinese counterpart, Chinese products score high on consumer’s list due to their lower cost. Chinese imports increasing every year and they producing products from lights to crackers and from toys to ganesh idols. Several cases of shutting down of many Indian small scale industries have been reported over the years as they are not able to compete with the prices. 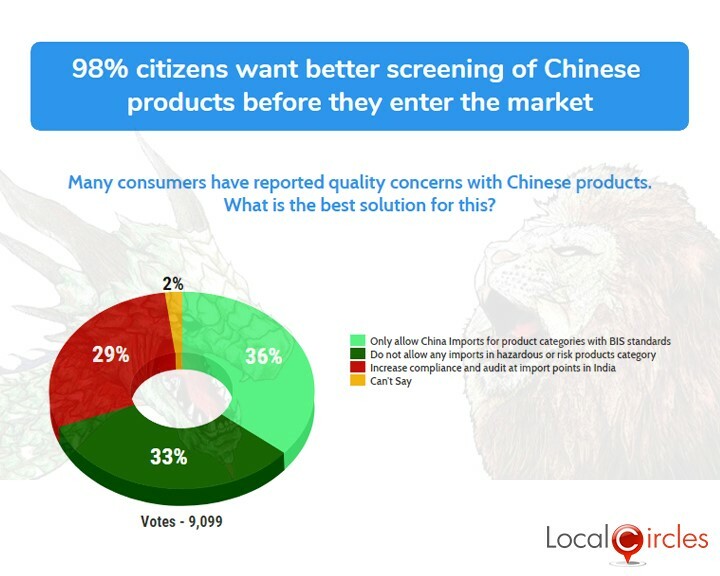 In the fourth poll which got 9,099 votes, citizens were asked what was the best solution for the quality concerns reported for Chinese products. In response, 36% said we should only allow import of Chinese products with BIS standards and 33% said imports in hazardous and risk products category should not be allowed at all. 29% said compliance and audit at import points in India should be increased and a small 2% were not sure about their preference. It is clear from this poll that citizens want better screening of Chinese products before they can enter the Indian market. Citizens want the Government to put a strong check on the low-quality imports from China and to impose anti-dumping duties to protect the interest of the Indian industries. Many citizens outlined in the structured discussion that for product categories where standards don’t exist, products imported should be following standards of developed markets than no standards at all. 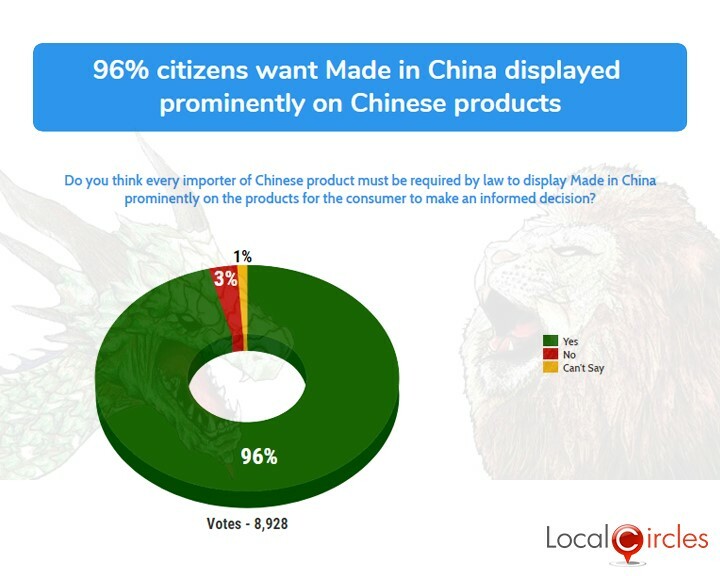 In the fifth poll, 96% people said every importer of Chinese products must be required by law to display Made in China prominently on the products for consumer to make an informed decision. Of the 8,928 people who responded to the poll, only 3% did not think it was necessary and 1% were not sure about it. After people started becoming wary about buying products which said, ‘Made in China’, some of the manufacturers started writing Made in PRC (People’s Republic of China) to get by. Some manufacturers also completely removed it from their products. India’s trade deficit with China stands close to a whopping $51 billion. In 2016, India imported almost 5 times from China than what China imported from India. This has not only led to inferior quality products penetrating Indian market, but it also means that there is an unfair competition to the job intensive Indian MSME sector which is not able to match the prices of the Chinese imports and are forced to shut down, rendering thousands of people jobless. Many associations and ministers have demanded ‘blanket ban’ on Chinese products, saying this was the only way to save the medium, small, and micro enterprises (MSMEs) from being destroyed. 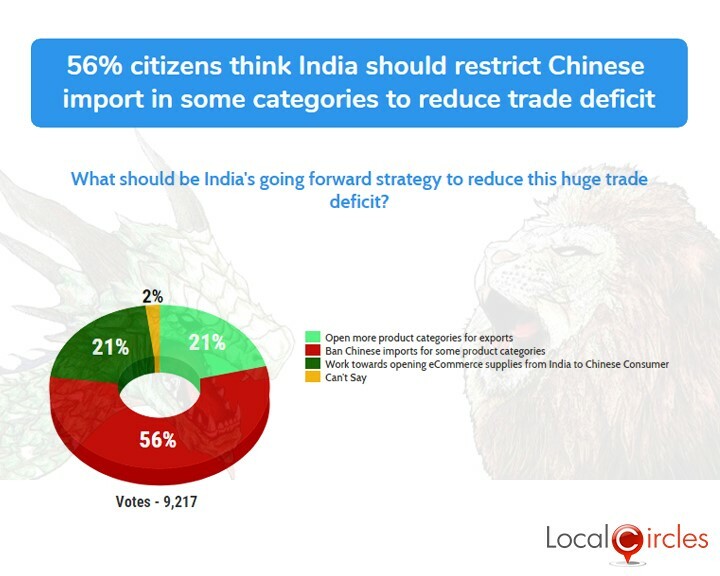 The last poll asked people what should India’s strategy be going forward to reduce the huge trade deficit. 9,217 people voted on this poll and 56% of these want Chinese imports in some product categories to be banned. 21% want more product categories to be opened for exports. Another 21% wants the government to work towards opening eCommerce supplies from India to Chinese consumers and 2% did not answer the question. In various structured discussions, citizens also suggested many other ways through which the trade deficit with China could be reduced and the Indian MSME sector could be protected. These included a crackdown to be made on illegal Chinese imports, banning import of Chinese products which act as an unfair competition to the Indian made products, under-pricing of Chinese imports to be stopped and withdrawing licences to import Chinese lights, crackers etc. Citizens also said that government should take actions to reduce production costs in India and defining proper standards according to which Chinese imports should be done. Citizens also demanded that the Indian Government at the very earliest work with their Chinese counterparts to opens more areas where products and services from India could be exported to China, including looking at if Indian ecommerce sector could be given access to the Chinese consumer especially in regards to products where the origin is Indian or India is a leading global exporter. The 6 point poll above received over 50,000 votes and over 20,000 unique citizens from over 200+ districts of India participated in the exercise. Approximately 64% of the participants were males and 36% were females. Approximately 40% participants were from Tier 1 cities, 30% from Tier 2 cities and the remaining 30% were from Tier 3 cities and rural areas.